Why should a transistor radio from 1954 be causing a buzz online? Could it be part of a realisation that, amid talk of invention, no novelty is completely new? The Old Testament Book of Ecclesiastes has a few words to say about novelty, fashion and innovation. The Regency TR-1 transistor radio, made in 1954, had a decent claim to be a genuine piece of innovation, however. It was, by popular agreement, the world's first commercially sold transistor pocket radio. The device went on sale just in time for hip young gadget freaks to hear Elvis Presley singing That's All Right - recognised by many as the moment at which rock'n'roll was born. The TR-1 was marketed under the slogan "See it! Hear it! Get it!" 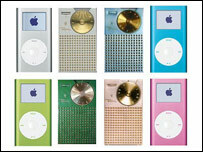 Hi-tech, trendy colours, rock music, punchy slogans... remind anyone of anything? When technology watcher John Ousby, who is head of distribution technology at the BBC, realised the modern day parallels, he knew he had to do something. "I did a bit of digging around," he says, "and found a good website on vintage electronics. I then matched photos of the transistor with photos of the iPod Mini." He then posted the above picture on the photo-sharing website Flickr. "Normally my photos there are viewed less than 100 times. But I was away for couple of days and came back to see there had been more than 15,000," he says. The similarity between the two has "created quite a stir", he says, particularly in the Mac community. He is, however, at pains to point out that he believes the similarity between the 50s radio and the iPod mini is purely coincidental. Apple declined to comment; some of those stirred by the debate definitely see the parallels. "I'd say a good engineer learns from a good thing, not to say they copy it," says one member of community discussion site Digg. "It'd also be decently safe to say that [Apple boss Steve] Jobs likes his old school design work, think about the iMac G4 for a sec; you've all heard the classic desk lamp reference. I could be really off base here, but look at how [animation firm] Pixar depicts certain common appliances/cars in films, pretty retro." Another adds: "Even Picasso was influenced by artists before him." Other readers might simply conclude that however new something seems - and even the iPod mini has now been replaced by a newer model - everything has its roots somewhere. Perhaps a thought for anyone who, flaunting their headphones in public, thinks they are being in any way "now". It seems that this says more about human aesthetics than copying old designs. We apparently have been liking small and simple for a while. All ideas are really 'piggybacked' from other existing ones, inovation occurs when you can add a new spin on an old product and bring it back to popularity. Apple has taken the existing, and lasting, want of portablility, and made it digital. I'm not really suprised this other device existed. Further proof that there is, in reality, no truely original ideas. Everything has been done before, and in most cases the way something new has been done was thought of many years ago before it became possible. Seems like colour radio was invented long before colour television. The Audi TT car design is strongly influenced by their racing products of the 1930's and the Bauhaus school. It will still look good in ten years time because of the simplicity of line. If you look at Hi-Fi design of the 1970's from Japan the idea of putting more buttons and lights on the facia than anyone else sold the product, but as a design it now looks very dated. Who said something about form following function? Has there actually been any new inventions in the last 15 years? All "new" inventions are just upgrades of existing pieces of equipment. The mobile phone is an upgrade of your normal landline phone, the laptop computer is a normal computer only much smaller, even the I-Pod is a fancy walkman!! I think the age of invention has passed and there will be nothing "new" invented for a long time yet. As a product designer myself, I find it quite sad that no-one seems to be curious as to who actually designed the casing of the Regency TR-1 (to be honest no-one seems to ask themselves the names of the people who designed the i-Pod either!). Products don't just "happen" - a designer sits down and creates them - not an engineer as the Digg correspondent wrongly suggested (engineers do all the clever bits inside of course, but not the external casing). Judging by the photo it was a talented designer who worked on the TR-1 and it seems a shame that no-one's interested in who he/she was. It would be regarded as odd to discuss a piece of architectural heritage without bothering to ask who the architect was, so why do us British ignore designers so readily? All good design is an evolution of past success. The artists and architects of the enlightenment looked to Ejypt, Greece and Rome for their prototypes to base their work on. Far from this being a negative association i think Apple should be applauded for encouraging such a good design process in their ranks. No one can deny that the execution of these designs are outstanding, with a level of thought in detail and materials that is second to none. The last few years has seen a 'retro' styling in many areas of consumer technology. 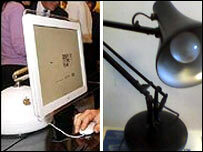 Could the preference for a nostalgic veneer signal a change in attitudes to gizmos and gadgets? We still want the benefits of new developments, but without the techno-anorak stigma. "See it! Hear it! Get it!" reminds me of a certain auction websites "But it. Sell it. Love it." The wheel is still circular.